What Kind of Quad Skate Should I Buy? Artistic Skates – These skates have high boots and an incredibly strong sole plate. While the high boots could provide some welcomed ankle support and stability, these skates are really made for jumping and landing (moves typical in dance, precision, and synchronized skating). Jam Skates – Jam skates are very low cut with a lightweight build and are great for the quick and agile movements typical of the Jam skating style. However, these skate have a dance plug in place of a toe stop, so they’re really only for skaters very comfortable on skates who are looking for more mobility. Rhythm Skates – This is another skate style without a toe break. However, unlike jam skates, rhythm skates have high boots for more ankle support. 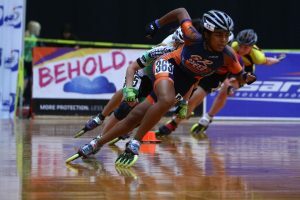 Speed Skates – As the name implies, speed skates are made for speed. The boot sits at about the ankle and is shaped a little more like a shoe than other skates on this list. These skates have relatively little padding and are very lightweight. Once you’ve decided on your ideal skate, let our pro shop help you buy skates in North Tonawanda. And if you already have your skates, check out our upcoming North Tonawanda special events and make plans to visit our North Tonawanda skating center today!